I arrived at Pembroke Bay in good time to set up in transition for the Guernsey Granite Man triathlon, 2013. 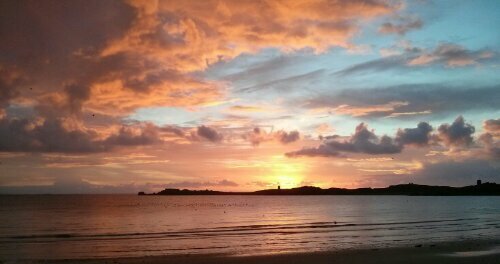 I also managed to catch a beautiful sunrise over Pembroke Bay. It showered during the pre-race brief but let up before the 0700hrs start in the bay. My feet were freezing to start but I rapidly forgot about them once I got moving. With a total of 150 competitors (110 doing the middle distance 70.3 course), there was plenty of space to spread out. However, that I meant that route finding was more important, something that I did poorly. Several competitors including myself drifted widely off course and into rocky terrain in the bay and were advised to get back on course! Torrential rain started hitting the water lowering my visibility and gentle swells pushed me to shore, so I focused hard on staying in course and not drifting off course again . Transition was smooth despite my towel being pre-soaked in the rain. I quickly pushed off on the two lap route. My lack of training on the bike was evident and I was uncomfortable in an aero position so had to spend longer than I liked sat upright. The transition to run was fast and I was pleased with the cheering crowds as I left transition. By this point the rain had stopped and I settled happily into my race pace and took in the scenery whilst keeping check on my pace. It was actually a relief to be off the bike and my back thanked me for it. The run went by fairly uneventfully – lots of food and drink stations staffed by very friendly volunteers, beautiful coastal views and a strong sprint finish. Congratulations to all competitors and a big thank you to all organisers, volunteers and supporters!